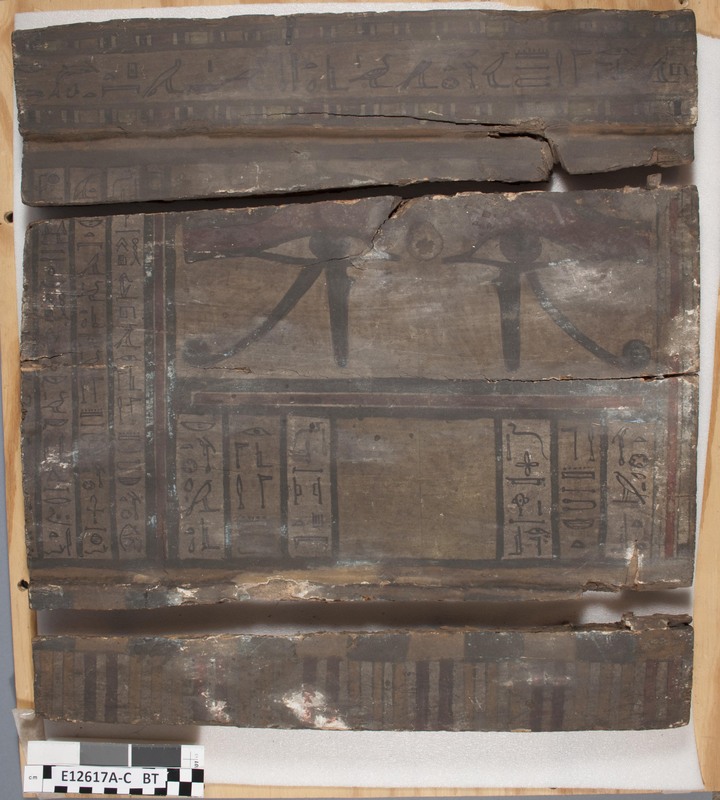 I recently completed the treatment of these coffin board fragments. In addition to the cleaning, which I blogged about before, the treatment involved stabilization of loose and powdery gesso and paint, filling losses where needed for structural support, and x-radiography, multispectral imaging, and portable X-ray fluorescence (pXRF) analysis. It has also enabled a translation of the text. I’m going to write a few shorter posts to highlight the different components of this project, starting with the x-radiography. During my initial examination of the boards, I could see that the boards represent just a portion of the front, head end of the coffin. The rest of this side of the coffin would have continued much further to the left, but at some point these pieces were cut down and finished off on the left side to a smooth edge. This is most evident when you look at the hieroglyphic text, which obviously should continue to the left. I could see that these 3 boards were originally joined with wooden dowels, because there are wooden dowels protruding from the join edges. I also noted some large cracks in the painted surface of the largest (center) piece in the image above, which led me to realize that this central piece was made of more than 1 piece of wood. I turned to x-radiography to get a better understanding of what is going on below the surface. The dowels joining the 3 pieces together are very clear in the x-ray image above. There are some darker (almost black) areas, which represent the holes that were drilled out for inserting the dowels. The denser (whiter) areas within those voids are the wooden dowels themselves. I’ve outlined these areas in green in the image below. The x-ray image also helps clarify how the center piece is constructed, with 3 pieces of wood, which I’ve outlined in red above. Where those 3 pieces of wood join correspond directly with the cracks observed in the painted surface on the exterior. 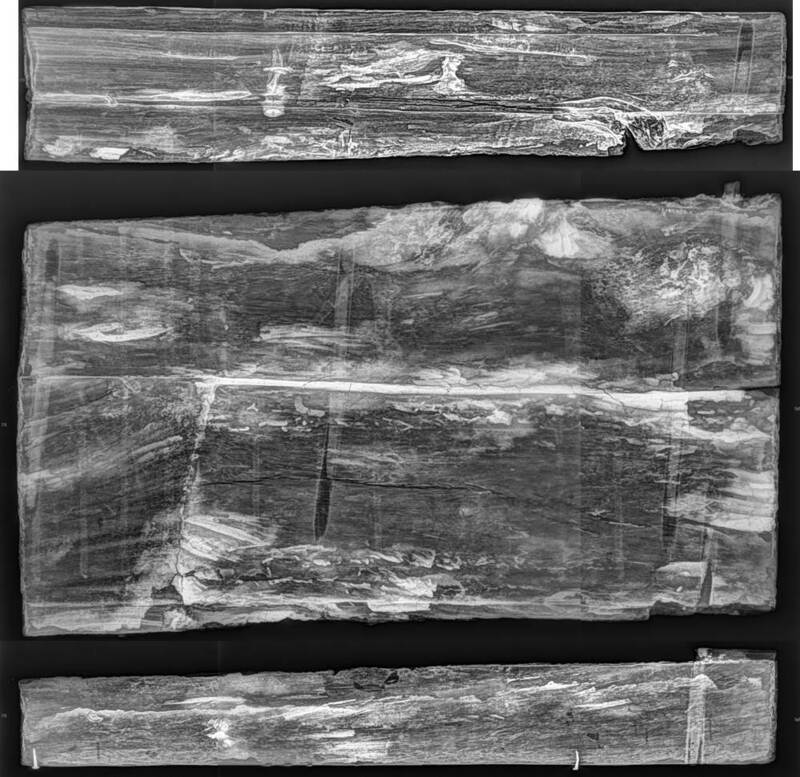 Also visible in the x-ray image are two small nails driven into the lower edge of the bottom board. These nails are historic additions, likely added at the time when the boards were cut down and modified, although their purpose is unknown. 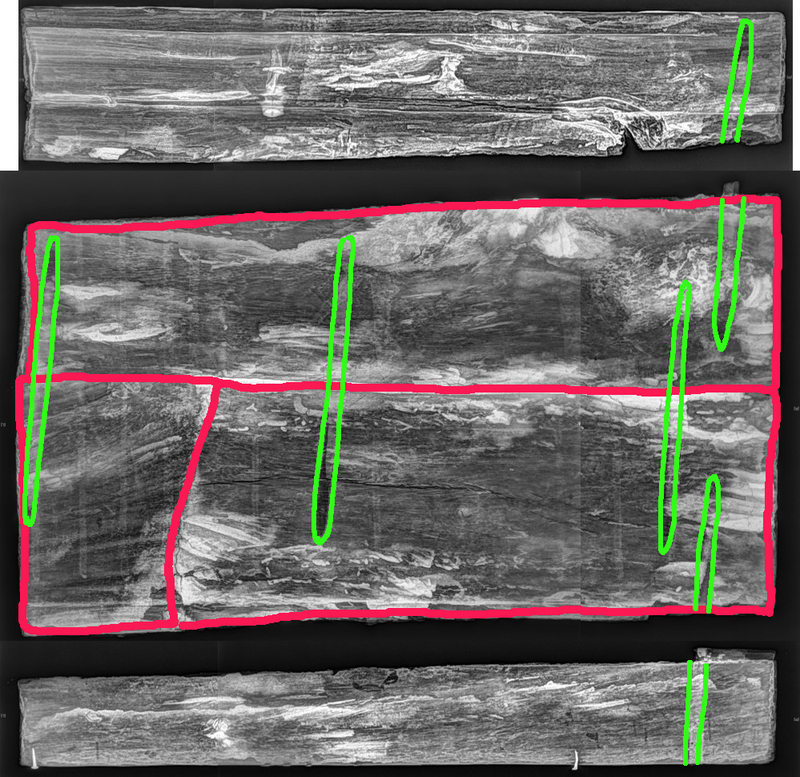 In my next post, I’ll focus on what cleaning, pXRF, and multispectral imaging has revealed about the painted surface, and I’ll include some after-treatment images. This entry was posted in examination, imaging, Objects In the Artifact Lab and tagged digital radiography, painted wood, painted wooden coffin, wood joinery, x-radiography, x-ray by mollygleeson. Bookmark the permalink.